If the world is going to end, the best place to be is in a Swiss hotel. That is the impression you get from Hanna Jameson’s The Last. American historian Jon Keller is staying in L’Hôtel Sixième when nuclear attacks hit Washington, New York, and other cities across the world. Apocalypse novels can be strangely coy about the causes and impact of the apocalypse. Safe in the hotel and surrounded by forests, the world-altering events of the outside world are at first limited to headlines and the strange new shades of the sunsets. It’s a while before anyone thinks to go outside to scout for food, let alone try to locate other survivors. Which is not to say The Last doesn’t compel. Jon is trapped with a couple of dozen people with whom he has little in common, they are running out of food, and afraid to drink the water. Jameson captures the feeling of claustrophobia and panic. Guests lose themselves in drink and drugs and random hookups. A man takes a deliberate overdose. With only one doctor in the crew and little practical skills, it seems like the Sixième guests won’t last long. And then Jon finds the body of a child – murdered, perhaps before the apocalypse. Now I felt it, the crushing existential weight of the loss. Commutes, and calling your representatives over something you saw on TV, reading news articles online, all of them getting progressively worse, going to march after march amid the creeping sensation that nothing was changing, that governments weren’t scared and people were nowhere near as scared as it should be, spending day after day at work talking about politicians we hated and battles we were losing, worrying about our future and whether your children would have one, and then it was all gone. At least Jon gets to meet more interesting people – Peter the dyspeptic German child psychologist, Adam the young boozehound and Tomi, Jon’s on and off girlfriend – Tomi is a fellow American but is everything Jon is not, clear headed, plain spoken and stylish. There’s a bone of contention between the guests as to who voted for the disaster president who began the nuclear war and it makes you think of how much of the nuclear winter will be spent bickering over the ruins. Jameson deepens the sense of claustrophobic horror by giving the hotel a spooky backstory and the guests elements of dark mysteries in their own lives. 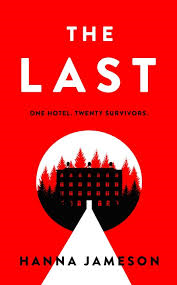 The hotel’s mystery builds to an unexpected conclusion but for me it’s the endpapers and the last passage of Jon’s narration that gives this novel its payoff. The Swiss landscape of chalet and forest suddenly feels like an impassible tundra in Jameson’s hands. This entry was posted on February 19, 2019 at 8:36 pm and is filed under Fiction. You can follow any responses to this entry through the RSS 2.0 feed. You can leave a response, or trackback from your own site.